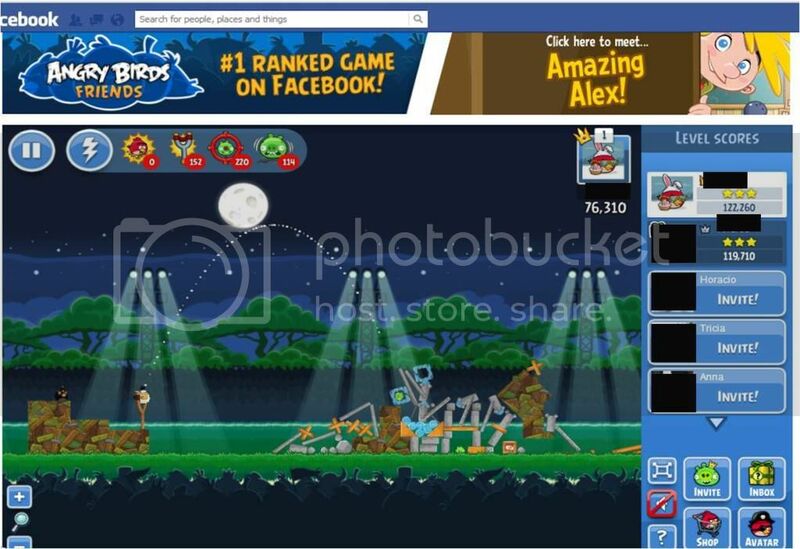 Walkthrough video and strategy for Angry Birds Friends on Facebook Tournament Level #1 Week 7 (this tournament began the week of July 2nd, 2012). Our strategy for this level is to fling the white bird up and over the first tower so he comes down in front of the second, detonating the egg bomb right above the bridge. This should take out the right tower and the pigs on the right hand side. Now fire the next white bird into the second tower, taking it out. 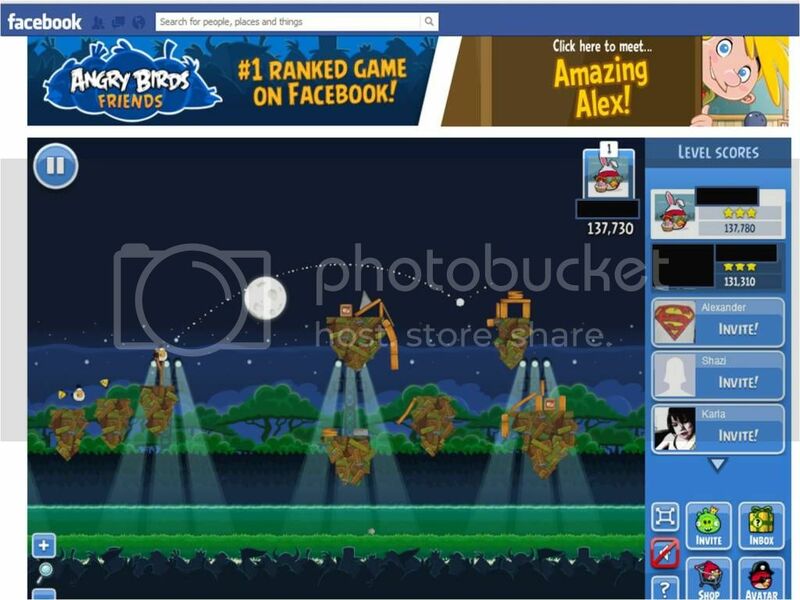 Use the yellow bird to take out the remaining pig on the bottom left. The score in the video is 117,360.
oh, the 2nd shot with my Strat is near the same as the 1rst shot in the vid. you have to hit far enuff right so bridge swacks out the Middle Bottom pig. I got 135k with the 2-bird strategy, white bird ricocheting on top left and bombing bottom left, then late release bomb on the far right structure. Oddly enough, the late bombing for the first bird is somehow more difficult because the egg bomb doesn’t fall straight at some times. What happens is the TNT box is pushing the egg away. I keep having this happen as well. I think it’s possible to do this with one bird. Aim the WB to take out top left tower so that the bird bounces into the right top tower, debris falling and flying allover takes care of the rest. So far I need the 2nd birdie to finish up the bottom left structure, but I’m sure I’ll make it. Oh yeah, with 2 birds my best so far is 132130. It is possible to do this level with 1 bird but I have only managed 136k with it. It is really difficult to get 1 bird to destroy all the pigs. Not an easily repeatable strategy I believe. Thanks. Seems like a good way to go, but perhaps a bird quake after the first bird would take care of the rest (making it a one bird plus BQ strategy). By the way, it’s funny how the white egg seems to get deflected on the side of the rock. I didn’t know that could happen. I have also been playing with the idea of first WB going through the lower part and then the ricochet taking care of the bridge, but I have not been able to pull it off appropriately. We’ll see. I never have BQs to try out lol. Feel free to see if it works. I tried various methods but couldn’t find anything high scoring. One bird ricochet off the top left onto the top right tower does eliminate the pigs but I haven’t been able to get a lot of destruction so only scored 136k. The bird quake gets rid of the pig on the extreme right and, more importantly, exposes the TNT (which should in theory make it easier to gain some additional points in there). However, que bird quake does not seem to be able to collapse the tower on the top right (but I am the unluckiest user of BQs in the whole tournament). Thus far 138 K with this strategy, but I have not had any luck detonating the TNT below. that’s a beutiful angle for the 2nd shot. I’m going to try, same, but reverse the order. 3. Getting rid of the lower tower is not that frequent. So, a second white bird going in the direction of that tower (maximizing damage with the ricochet to the right) should still give you more than 130K points. So, there go. The reverse order also seems works. Now the question is: which strategy is better? Aim WB at top left pig, drop egg below to the pig in the concrete “house”, and hope that the 2 concrete triangles break the bridge and the bird hits the top right pig’s location. As @sheikhoo said, it’s not very repeatable. Took me a lot of tries. Here’s that elusive one-birder that everyone is talking about. And the other one. 2-birder, same method as sheikoo, not quite as high of a score, but proof that it is repeatable. Not nearly as pretty as his, but it did the job. Finally hit 139k with 2 birds and a BQ. Can’t break 140. Argh. You gotta use shake after the first bird if you wanna detonate that TNT on the right with your second bird. Almost never blows, otherwise.